Posted: Monday, August 7, 2017. 4:54 pm CST. Posted: Monday, August 7, 2017. 4:54 p.m. CST. 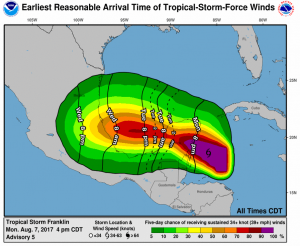 By BBN Staff: Tropical Storm Franklin is located at about 120 miles east of Chetumal, Mexico, and is moving to the west-northwest about 10 to 15 mph. According to the Weather Channel, a tropical storm warning has been put into place in the Yucatan Peninsula, including Cancún and Cozumel, and as far south as Belize City. A tropical storm warning means that winds in excess of 40 mph are expected and that preparations for the storm should be rushed to completion. 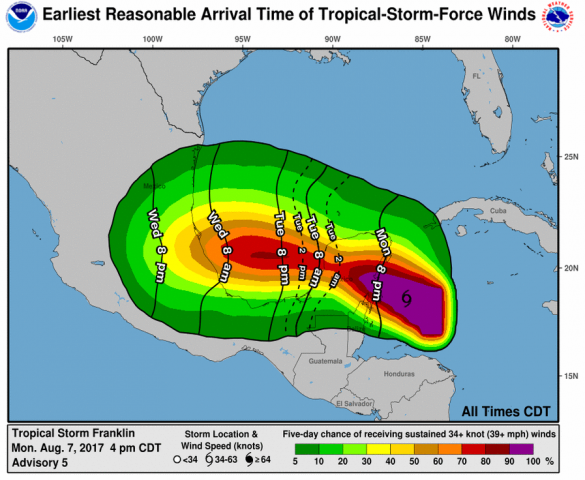 Officials in Mexico City have prepared shelters, cleared storm drains and announced the closing of an airport near the Caribbean coast in preparation for the arrival of Tropical Storm Franklin to the Yucatan Peninsula. Here in our own country, Emergency Operation Center (NEMO), which is located at the YWCA conference room, is keeping a close eye on the storm and have had personnel’s in place since 9 this morning. NEMO Coordinator Clare Moody stated that shelters have not been opened as yet, however, they will be opened as needed. For more information you can call Clare Moody at 630-9791 or 822-2451, 822-2452, 822-2428 or 911.